Media dis&dat: If you can't beat 'em, join 'em: Gov. Paterson appears on season premiere of "Saturday Night Live"
If you can't beat 'em, join 'em: Gov. Paterson appears on season premiere of "Saturday Night Live"
Gov. 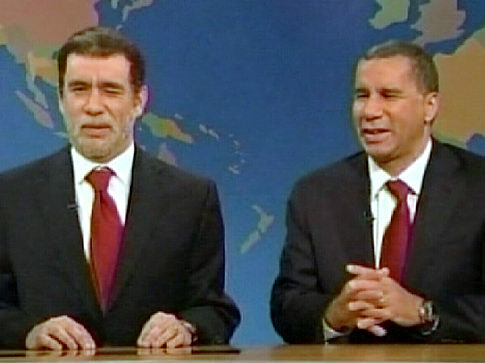 Paterson (pictured), who has been mocked relentlessly by the cast of "Saturday Night Live," turned the tables on the show last night by comparing it to Albany. "Ladies and gentleman, I wanted to come here tonight before my time as governor of the great state of New York ends to tell you that working in Albany is just like watching 'Saturday Night Live,'" Paterson said. "There are a lot of characters. It's funny for 10 minutes, and then you just want it to be over." Throughout his turbulent tenure as governor, Paterson has been portrayed on the show as a bumbling politician who loves to denigrate New Jersey and frequently bumps into things. Appearing alongside Fred Armisen (pictured), the actor who imitates him, the partially blind governor blasted the show's portrayal of his disability. "Jokes that degrade people solely for the fact that they have disabilities are sophomoric and stupid," Paterson said. His scolding prompted an apology from SNL star Seth Meyers. Still, Paterson kept things light. "Just by my sense of smell, I can tell that there are 15 people in this audience from New Jersey," Paterson said, drawing raucous applause. He and Armisen then stumbled off the stage into the camera as host Amy Poehler smiled behind them.